Known for their mostly bright yellow tart fruit and white blooms that fill the landscape with their sweet fragrance, lemon trees (Citrus limon) bring a tropical flair to landscapes and containers. Fussier and not quite as hardy as other varieties of citrus, lemon trees can produce bushels of fruits for years when given proper care. The key is overcoming common vulnerabilities, such as pests, diseases, and a lack of cold tolerance. These broadleaf evergreens can grow up to 20 feet tall, depending on the variety, and they have lovely, leathery green leaves. They are ideal for gardeners living in USDA plant hardiness zones 9 through 11, who can grow lemon trees outdoors year-round. Do not despair if your climate is cooler because lemon trees are well-suited for growing in large containers, as well as indoors. For the best production of blossoms and fruit, always plant lemon trees in locations that receive full-sun for six to eight hours each day. Trees planted in sites that receive too much shade will have a reduction in blossoms and fruit. If your soil has a tendency to retain too much water, create a raised mound that is several feet off the ground to grow the lemon in. The raised area will hold the root system up and out of the saturated conditions. There is no need to amend the planting site's soil with well-rotted manure or compost. If you feel your soil is too poor and lacks any nutrients, only amend the soil you remove from the planting hole with 50 percent organic matter. Mix the organic substance into the native soil and backfill into the hole. Be sure not to plant the lemon any deeper than it was originally growing inside the pot. Covering the graft or the tree can result in rot. In fact, planting the tree several inches higher than the level of the ground assures water will not accumulate around the trunk, leading to healthy growth. If you are growing the lemon indoors, situate the tree in a sunny location or area that receives sunlight for the vast majority of the day. Container-grown trees will thrive in a rich potting mix that drains well. Be sure to use a container with bottom drain holes. To allow enough room for proper root development, plant young lemon trees in five-gallon containers and transplant into a one-size larger container every several years before the plant becomes rootbound in the pot. Lemon trees planted in the appropriate location with preferred soil and light conditions are generally vigorous growing citrus trees. However, the tree has some general requirements to maintain healthy growth and fruit-production. Keep the area under the tree's canopy free of any weeds or grass, as the unwanted growth robs the tree of nutrients and water. Keeping the area weed- and grass-free also lessens the chances of damage to the trunk due to lawn equipment, which leads to disease problems. Remember, most types of lemon tree have a heavy layer of thorns lining the branches and trunk; however, some types are thornless to nearly thornless. Due to the tree's thorny nature, it's always a good idea to wear gloves when dealing with it. Pruning requirements of lemon trees are low. If the tree suffers damage during cold weather, wait until the warm temperatures of spring before pruning. Many times branches that might look dead during winter will show life in springtime. Otherwise, prune to remove dead or diseased wood, crossing branches or to shape. 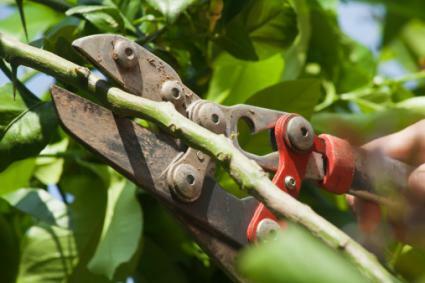 When making your pruning cuts, always cut off the dead section of wood just into the green section of the branch, making your cut at an angle. Sterilize your pruning tool blades before using to reduce the chance of spreading diseases to the tree. This is as simple as wiping your blades off with a cloth saturated in alcohol. Always water a lemon tree immediately after planting, saturating the planting site or container. Newly planted young trees can require water several times each week for the first few months while the root system establishes itself, especially during hot and dry weather. To keep the water in place over the root system, create a soil dam under and around the tree's canopy. After several months, the dam will slowly work itself back into the surrounding soil. Once established and unless conditions are dry, water the tree every other week. To help the planting site retain moisture and reduce unwanted weed growth, apply several inches of mulch under the canopy, being sure to keep it several inches away from the trunk. Lemon trees grown in containers, whether indoors or outside, require water when the top inch of soil dries. Stick your finger into the soil and if it feels dry, water until it runs from the bottom drain holes. Lemon trees are big eaters and require regular applications of fertilizer during the growing season to keep them healthy and growing properly. Always wait for young trees to produce new foliage growth before feeding. 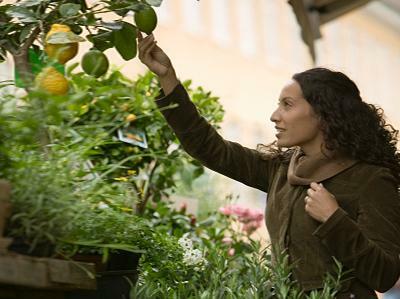 Citrus fertilizer blends contain all the necessary nutrients to keep the tree healthy. Healthy trees have a better chance of battling pests or diseases than stressed trees. Other than citrus fertilizer blends, gardeners can also use fertilizers such as well-rotted manure, ammonium sulfate or ammonium nitrate. Follow package directions on required amounts and give the lemon tree three to four feedings during the growing season. When applying any fertilizer product, sprinkle evenly under the tree's canopy, being sure to keep the fertilizer several inches away from the trunk to prevent burning. 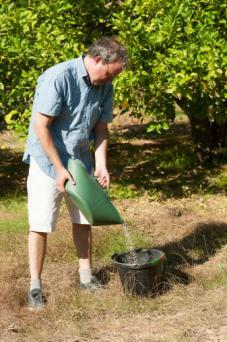 After applying, always water the fertilizer into the soil and off the foliage. To keep fertilizer salts from burning container-grown trees, every several months flush the container with water. Lemon trees do not tolerate frosts and freezing conditions and require a year-round warm environment to thrive. Gardeners have various options for protecting a lemon tree planted outdoors in the ground in the event unexpected frosts or freezes occur. Planting on the south side of the house guarantees the tree receives the most warmth, as well as protection from cold winds blowing in from the North. Water the soil around the lemon tree well before the cold temperatures arrive to conserve warmth in the soil. String outdoor holiday lights throughout the canopy to help maintain warmth to the tree. Cover the lemon tree. You can use sheets, burlap or a large piece of cloth to help conserve warmth. If you cover the tree with plastic, be sure to remove it during the day when the sun is out or the foliage can suffer burns. Container trees left outdoors during a frost or freeze without protection can drop all their foliage and suffer branch dieback or even death during freezing temperatures. If your tree is grown inside a container, bring the container indoors to a sunny location during a cold snap. For ease in moving large containers, situate the pot onto a plant stand that rolls. As with other varieties of citrus trees, lemons are prone to several pest infestations and diseases. Most of the time, these problems are preventable by giving the tree proper nutrients, allowing enough space to spread, and growing in a proper site with preferred cultural conditions. Fortunately, many lemon tree pests only produce cosmetic damage to the tree and are not life-threatening to the tree's health and survival. Gardeners have various pest-control options that will manage out-of-control pest infestations and are safer for beneficial insects and pollinators. Common pests infesting lemon trees include various scales, spider mites, aphids, mites, mealybugs, leafminers, and most damaging of all, the citrus psyllid, which transmits the deadly disease citrus greening. Many times the pest is noticeable on the lemon tree's foliage or you might notice signs of their damage, such as leaf curling, leaf distortion, lines covering the foliage, branch dieback, and in severe cases, defoliation. Young trees are more susceptible to damage than older and more established ones. Insecticidal soap controls heavy infestations of pests such as spider mites, aphids and mealybugs. If scale, citrus psyllids, or leafminers are problematic, use a horticultural oil to control the problem. Mite problems are controllable by using a sulfur spray. As with any product, always follow label instructions for its safe use and handling and apply the products to the lemon tree when conditions are shadier, such as early in the morning or late in the afternoon to prevent leaf burn. Fruit Drop: Problems such as fruit drop can be a natural occurrence due to the tree producing more lemons than it can support. Lemons can also drop from the tree or split due to inconsistent watering practices and show vertical leaf curling. Giving the tree regular applications of water, especially when conditions are hot and dry should prevent these problems. Sunburn: Just like people, lemon trees can suffer from sunburn, especially when conditions are hot and sunny and foliage is sparse and unable to protect fruit hanging on the outer edges. Foliage will show symptoms by taking on a bleached appearance, and fruit will have scorched blotches. This is mainly a seasonal problem with no action required. Citrus Greening: The citrus psyllid transfers this disease to lemon trees and is untreatable once infected. The best course of action is to maintain the health of the tree and making sure there is good circulation of air around it to cut down on pest problems. Infected fruit is misshapen and small, limb dieback occurs, and foliage becomes yellow and blotchy. 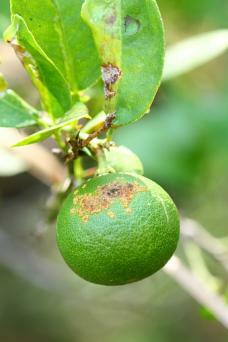 To keep the disease from spreading to other citrus trees planted in the landscape, remove and destroy the infected tree. Foot Rot: Rot occurs in lemon trees planted in soils that retain too much water or are planted too deep. Symptoms of foot rot show as peeling bark on the trunk where it meets the soil and branch dieback. As the rot develops, a black almost gummy looking substance forms on the base of the trunk, and the lemon tree eventually dies. The best course of action in preventing foot rot is planting the lemon in well-drained soil, avoiding butting mulch against the trunk and keeping water off the trunk when watering. Citrus Canker: Lemon trees, especially new growth, are prone to citrus canker disease, a bacteria spread by the wind and using unsanitized equipment. Symptoms show on the foliage as small spots encircled by yellow and grow larger over time. Heavy infestations cause defoliation though usually aren't life-threatening to the tree. Treating the lemon with a copper fungicide will control the problem. When grown outdoors, lemon trees don't require help with pollinations because nature lends a hand in the way of butterflies and bees. However, container-grown trees that live most of their lives indoors do need help. The easiest way to pollinate the blooms is to bring the tree outdoors once the blooms begin forming, and nature will take care of things for you. Otherwise, you can mimic nature through hand pollinating by taking a cotton swab or small paintbrush and dusting the end from one blossom and then dusting another open flower with the pollen. Some types of lemons are everbearing, which means they flower throughout the year producing fruits year-round. Young trees bear fruit when they are around three years old. Lemons are ready for harvesting once they reach their peak color, which can take up to a year. If the fruits don't easily pull off the tree without ripping the branch, use sterilized pruning tools to snip them from the tree. 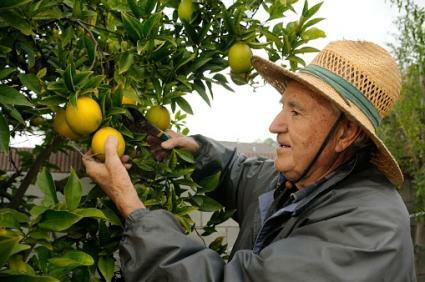 If you can't use all the ripe lemons at once, they will store well in their ripe stage on the tree for several months. Just one lemon tree planted in the landscape and properly cared for will produce more fruit than probably one house can handle. Besides their many culinary uses, lemons also bring a fresh and acidic taste to drinks, and unused juice is suitable for freezing. Despite the tree's tendency for high maintenance, the year-round production of fresh fruit is worth the extra attention.